Prospect Hill Map 1 (9.1mb) Updated 3/2016, Prospect Hill XC race track area. Prospect Hill Map 1 – inset (1.1mb) Updated 3/2016, Higher resolution map of the MTB specific trails. 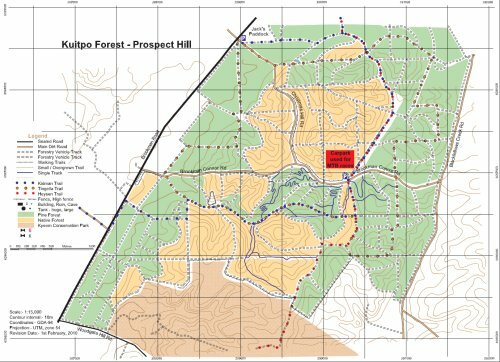 Prospect Hill Map 2 (1.2mb) Updated 7/2010, Forestry HQ easy green trails. The single tracks in the MTB race area are not signposted. The trails following vehicle tracks (Kidman Trail, Tingella Trail and Forest Trails) are signposted. Toilets: No. The nearest toilets are at the Kuitpo Foresty HQ on Brookman Rd. Prospect Hill Google Map of Trails area Parking available at Christmas Tree Hill car park on Brookman Conner Rd. Some great XC trails, but they are not easy to find, recommend taking someone who knows the area. This area can be affected by forestry logging or thinning operations. Forestry SA areas are open to the public during daylight hours only. Video shot of some of the trails on map 1 (November 2012). Video shot of some of the trails on map 1 (June 2011).